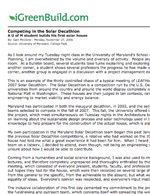 Check in periodically and watch as this list of press releases, newspaper articles, magazine pieces, and other press about LEAFHouse and the University of Maryland's involvement in the 2007 Solar Decathlon grows. 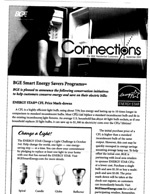 We archive all webpage articles as PDFs so we are assured they will be available to you. 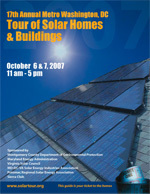 Adobe Reader (formerly Adobe Acrobat Reader) is required to view these archived webpages. 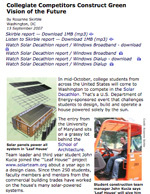 Click here to download a free Reader for Windows, Macintosh or UNIX. 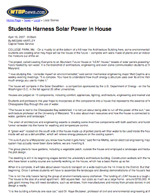 Interview of students and highlight features of the LEAFHouse. 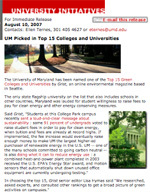 Article UM NewsDesk [PDF 118KB)University of Maryland was picked one of the top 15 green Colleges and Universities. 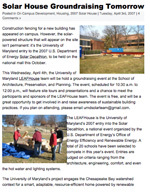 Article about the groundraising event for LEAFHouse at the University of Maryland. Editorial by Outreach and Fundraising team leader Sam McGlone about the collaborative experience of building LEAFHouse.